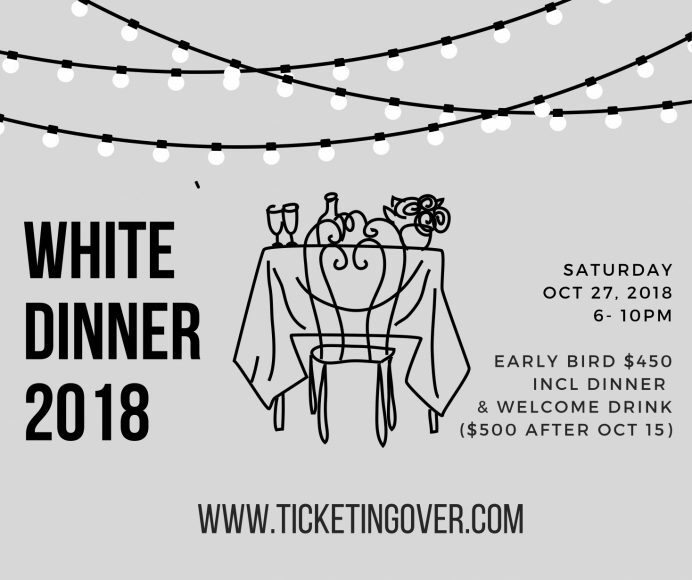 On Saturday 27 October 2018 from 6-10pm, the DCPTA will once again host their very own White Dinner. Dress in white and experience elegant dining in our gorgeous intimate surroundings. Delight in live entertainment, music, dancing, a silent art auction and prize for best dressed. After a three-course buffet-style dinner with surprise entertainment, a live band will create an opportunity to dance. Guests cannot bring their own drinks, however, a wide range of drinks can be purchased at our cash-only bar at the event, including a delicious selection of wines. Event photos will be made available to all guests after the evening and artwork from our Class of 2018 students will be available through silent auction, proceeds of which will be donated to the Art Department. Join us for this amazing dinner event with your friends and enjoy a special, starry night. We have limited seats available. Adults only. Tickets are available at the PTA shop or via ticketingover.com (early bird at HK$450; from 15 October at HK$500). For more information, please email PTA at dc.pta@dc.edu.hk.